My newest jewelry making technique and obsession involves stamping molten silver metal solder onto a brass or copper backing. Once the silver solder is heated to liquid it is then stamped. Once cooled it is then hammered to add more texture and dimension. These are two examples of quite different themes. 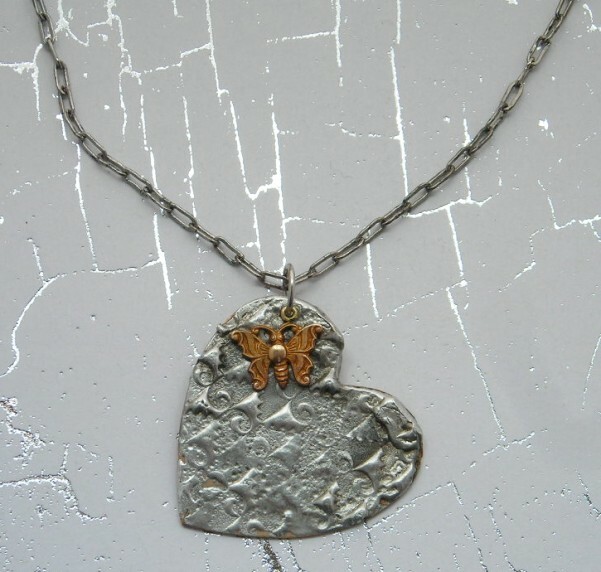 For both pieces vintage brass findings were riveted to the pendants. Can’t wait to try some more! I am patiently waiting for some Spring weather so I can enjoy the sight and aroma of the flowers. Plus I am just plain tired of being cold! I decided to make by own little spring bouquet. This first necklace represents my love for spring using Ice Resin. 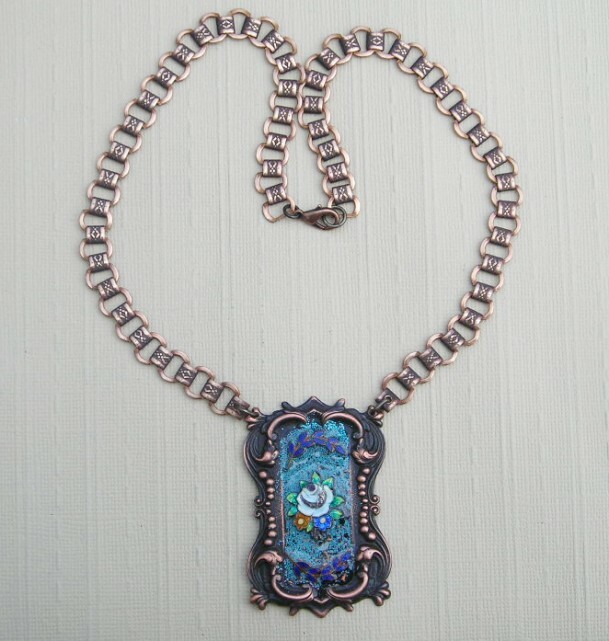 I made the pendant using a bezel to which I added various colors of Iced Enamels, heated and let sit. I poured in some Ice Resin and then added a vintage enameled flower bouquet and covered with more Ice Resin. I am slowly becoming an Ice Resin and Iced Enamel junkie! This next piece also used Ice Resin. 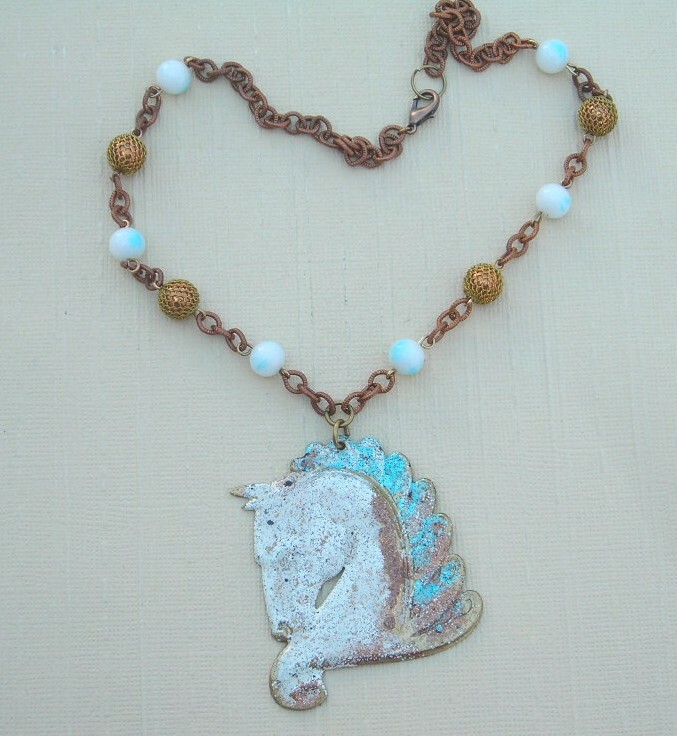 I made the pendant using a vintage Art Deco style horse, Iced Enamels and Ice Resin. I love the way it looks. If you love Ice Resin and want to share or just see some amazing things join the Friday Ice Linky party at Vintiquities Workshop. I decided that it was time to clean up my work space. I had bits and pieces of various things all over my space. 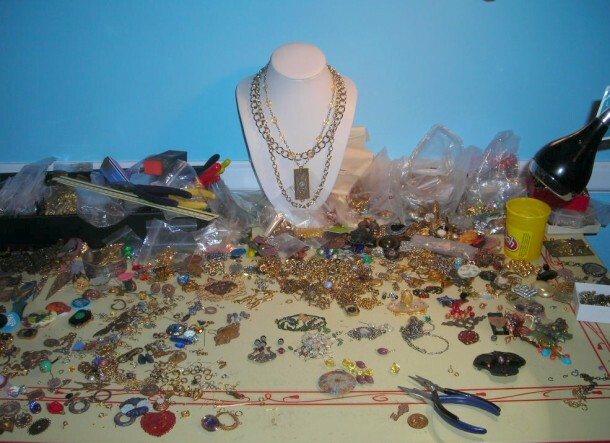 As I began to sort and organize the little treasures I found I decided to stop organizing and make some jewelery! 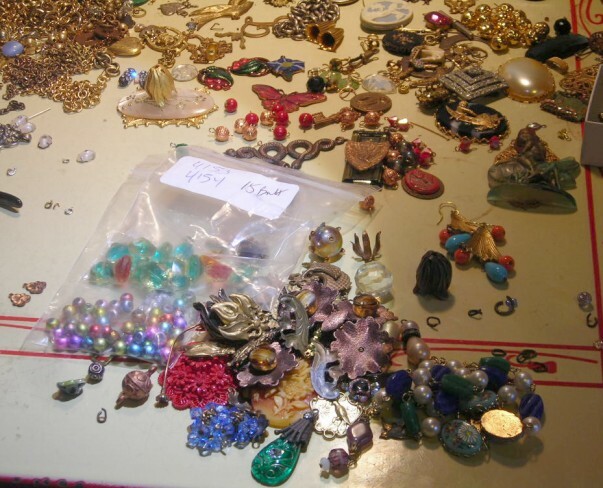 At the same time there was a jewelry making challenge hosted by Brenda Sue Lansdowne of B’Sue Boutiques. This challenge was called the Kitchen Sink Jewelry Challenge. Basically this style of jewelry is to load as much as possible onto the piece while still being appealing and seemingly balanced. You can read more about this at her blog. 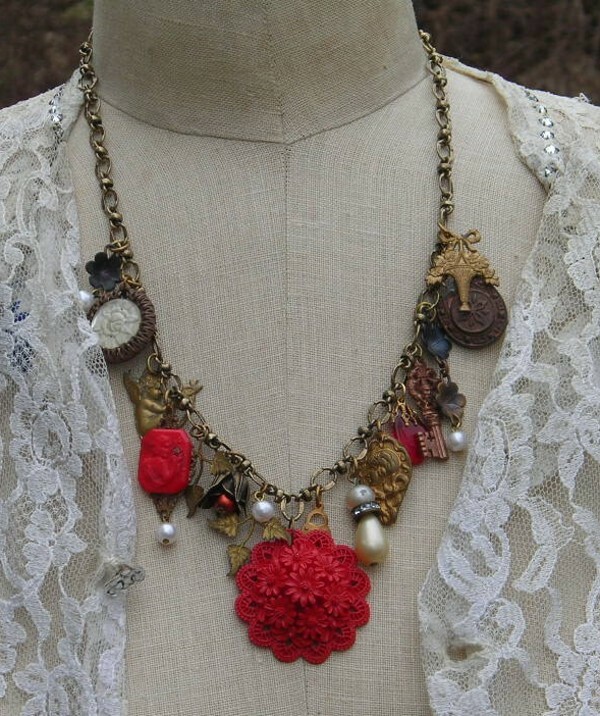 These are the two necklaces that came out of my “clutter”. As you can see from my previous posts I have recently discovered Ice Resin and am now addicted! It such a wonderful and versatile product. I have poured it into molds, used to over painted brass, as collage media and now I have tried their newest products Iced Enamels. 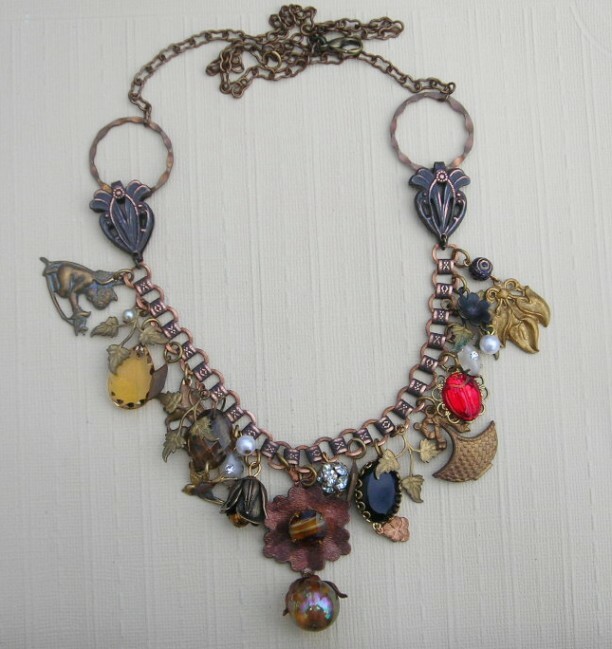 My designs tend to be inspired by nature and vintage jewelry. 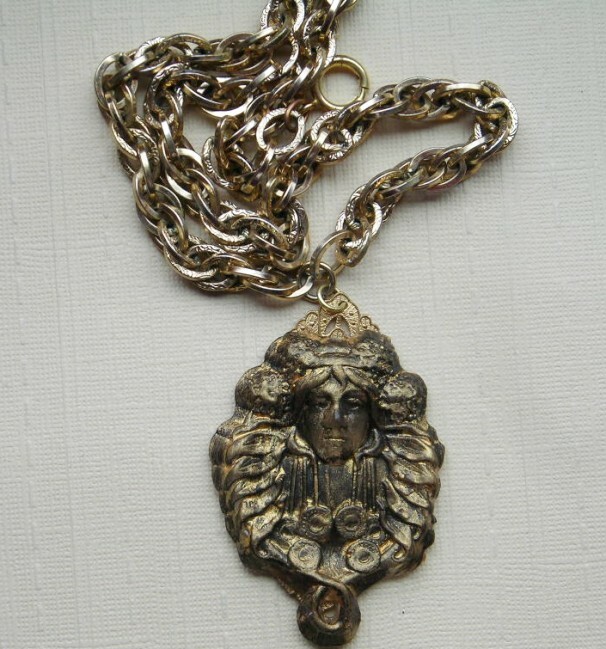 The pendant on this necklace was made by pouring Ice Resin into a mold I have made from a vintage brass art nouveau piece. I then painted the Nouveau goddess with acrylic paints. 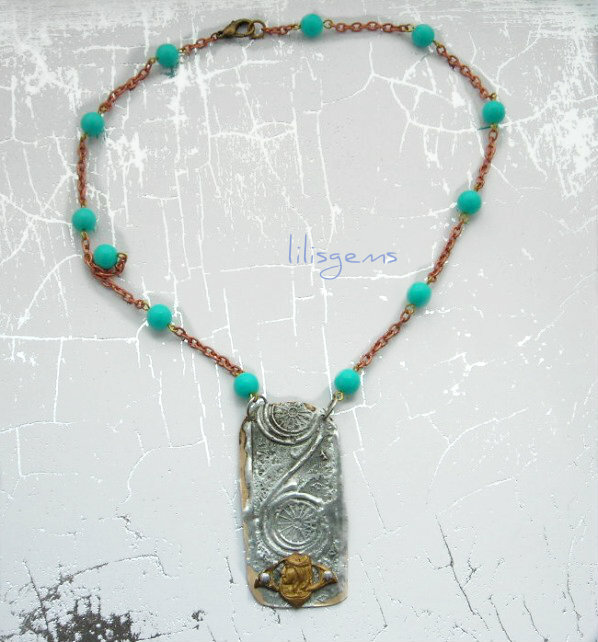 This second necklace was made using Iced Enamels in turquoise blue. 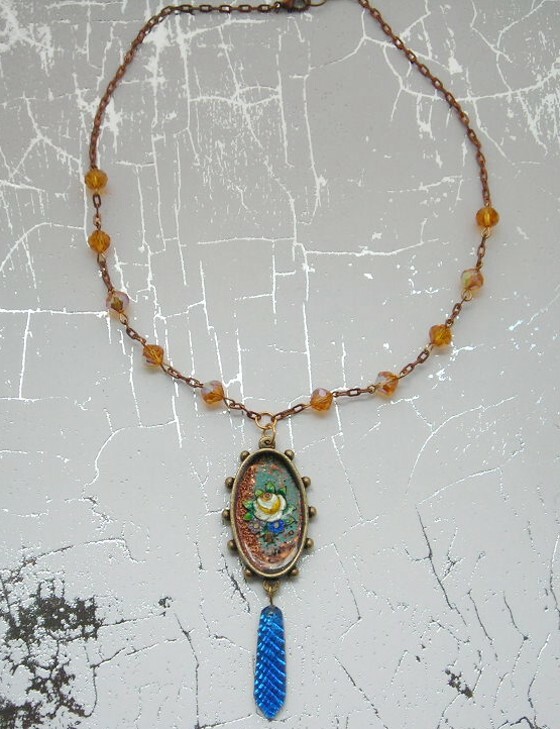 I used a vintage style frame bezel and added vintage enameled flowers and leaves. I love how it looks like fired on enamel.